Ensure your corporate travellers are safe, satisfied, and always in the loop with our enterprise travel management platform. In an age of uncertainty, be sure your staff are protected with our travel risk management package. Including mobile GPS tracking, identification of affected employees in an emergency, and personalised trip briefings, our application keeps your staff secure and alert to potential issues wherever they are in the world. 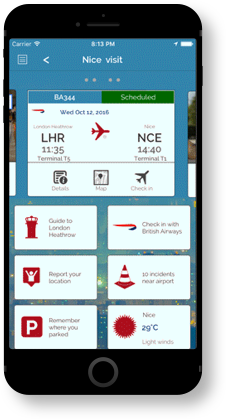 Give your staff everything they need for a friction-free trip – including in-app flight status updates, check-in reminders, city and airport guides, weather updates, currency calculator, and even real-time itinerary updates. All delivered straight to their mobile device. Make sure your travellers always have your key company information with them at all times; policy, preferred suppliers, office locations and telephone number all within your app. Send travel itineraries directly to an employee’s email inbox as a single, consolidated package with our automated document delivery. Save your staff the stress and inconvenience of managing and retrieving multiple travel and financial documents for travel briefings and physical document collection. Our team know the travel industry inside out, which means our platform can be integrated with your travel provider and booking tools. We’re also happy to accommodate your existing applications. Whatever your existing infrastructure, we’ll work to integrate your data with our systems so you have 360 degree visibility of your travel plans.